Facebook data team make it possible to see how we say to our friends that our team score in a soccer game. 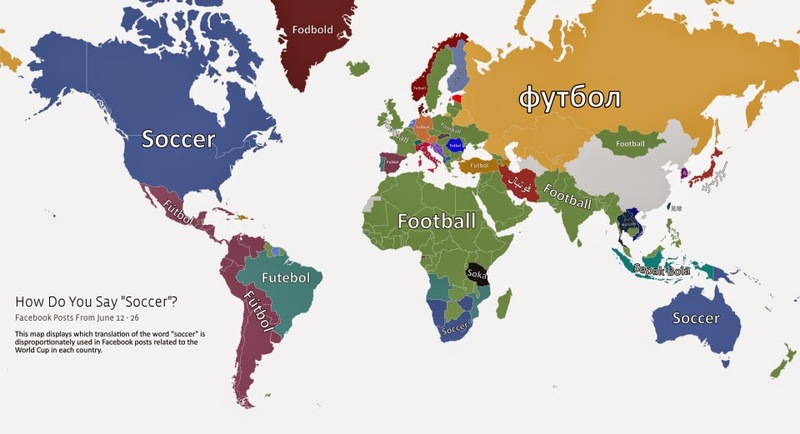 Lets start first with the length of the word "goal" in different countries. On the world map bellow you can see that the dark regions like South America like to write the word as long a possible (i.e. GOOOOOOOOOOOOOOAL!"). The winner here is Venezuela with 21 characters. The longest word "goal" written in Facebook during the world cup in Brasil comes from Argentina and is 20400 characters long (gooo....oool). If you try to write this word again you will need to hold down the letter "o" for 12 minutes! All this data is possible because of 1 Billion posts, comments, likes and photos on Facebook with the #wordcup.